Today's First Look is a special one, it is none other than Alpine Carolers designed in collaboration with our Design Team member Elena Roussakis. We are thrilled and proud to add Elena's original illustrations to the Mama Elephant line! Her illustrations are a mix of whimsy and sweetness! Appropriately, we think Alpine Carolers's first look should be presented by the artist herself. So this first card is created by Elena. Isn't it sweet? With a bit of masking, she was able to bring the two kiddies together, so cute! She also uses the new Instalove creative cut that we'll be unveiling! The banner is from Bloomsies stamps and creative cuts. Of course Angela and I had to get inky too with Alpine Carolers! I created a dramatic night scene by Blending Distress inks. The blotches of snow was created simply by flicking water onto the Distress inks. I then went to town with my Copics and colored the girls pretty vibrantly. I wanted a bold look to match the dramatic background. The stitched hill you see is created using another new creative cuts set, Borderlines Trio. I think you'll love it! 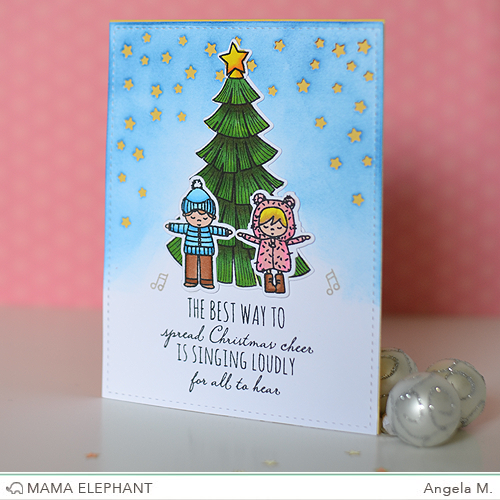 Angela created a similar card but in a softer color scheme using Alpine Carolers and the tree from Cozy Christmas stamps and creative cuts. She too blended Distress Inks for hr background. The starry background is cut from Starburst Cover. The stitched frame is from Peek a Frame. Check out Elena's blog, I hear she might have another look at these sweet carolers PLUS she's giving away a set of Alpine Carolers! OMG I'm in love with this stamp set! Definitely at the top of my list! I can't wait for they to be available! This release is being fantastic! So wonderful and cute! I just love these cuties! Absolutely adorable! Love all of the little carolers and everyone's cards! Oh my gosh, look like another awesome stamp set. I can't wait for them to be available. Love the little carolers and cannot wait for their release. Cards are so cute. I especially like the one using the tree from Cozy Christmas. Love these sweet little carolers! Great cards. The kids are adorable. So many ideas! Oh my goodness these are adorable!!! These little carollers are just adorable. What an adorable stamp set. I just adore these lil carolers. Beautiful bakgrounds and lovely cards. Oh my goodness, that little girl in her bear-earred coat is so darn adorable! how sweet are they?!! love! Happy birthday! I just bought a whole bunch of stuff with the 10% off...thank you! Can't wait to get my new goodies! Can't wait to make a card with a little boy on it with the caption...."I can't put my arms down" quote from A Christmas Story! My husband will love it...we have a quirky sense of humor :) Love these new stamps/dies! !